Ideal for the materials of dry granule trimming and wet granulation. Applicable to food, medicine, chemical and etc. : powder granule trimming, milling and recycling for tablets & capsules. 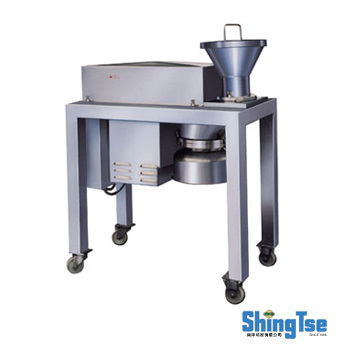 This machine is a multi-purpose one for dry granule trimming, wet granulation, smash and milling. Can produce special materials; granules are uniform; the loss is few. With low heat, low dust and low noise; can produce continuously. Easy maintenance and move; meet PIC/S GMP standards. 0~3500 RPM of speed; can adjust the rotational speed according to different materials. Optional aperture diameters of screens (stainless steel sieve rings): 0.4, 0.5, 0.6, 0.8, 1.0, 1.1,1.5, 2.0, 2.5, 3.0 m/m. Remarks: The above figures are for reference only; the specifications can be modified by manufacturer as needed.